They say the best way to get to know a city is to walk it – in Cork you can get lost in narrow streets, marvel at old cobbled lane ways, photograph old street corners, look up beyond the modern shopfronts, gaze at clues from the past, be enthused and at the same time disgusted by a view, smile at interested locals, engage in the forgotten and the remembered, search and connect for something of oneself, thirst in the sense of story-telling – in essence feel the DNA of the place. Cork has a soul, which is packed full of ambition and heart. Giving walking tours over 21 years has allowed me to bring people on a journey into that soul but also receive feedback on the wider contexts of what visitors and locals have seen elsewhere. Cork is a city packed with historic gems all waiting to be discovered at every street corner. This book provides into insights into about 60 such sites in and around the city centre island. One could have easily added three and four times as many sites to a book such as this. 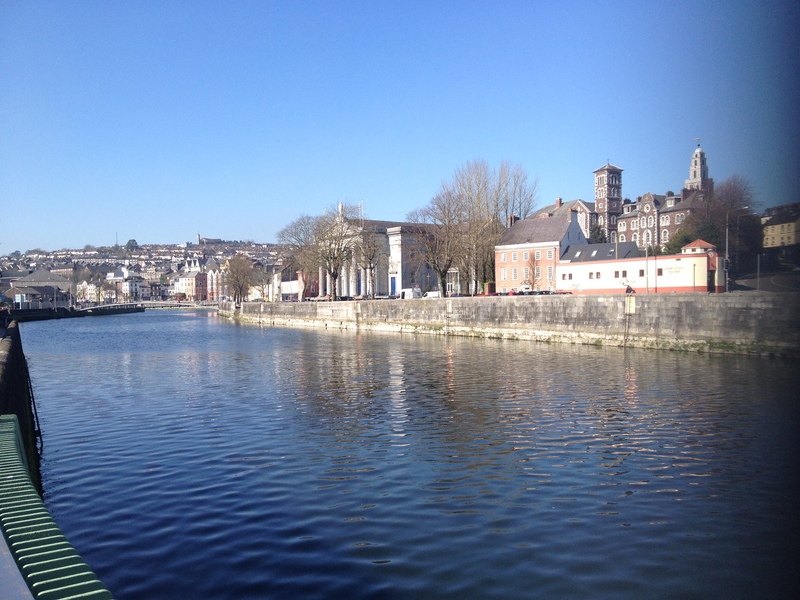 Cork possesses a north-west European and an eastern North Atlantic port story. Located in the south of Ireland, it is windswept by tail ends of North Atlantic storms, which consistently drench the city and rural areas with wind and rains – but they leave to showcase a very photogenic urbanity with amazing sunsets on the river channels and a resilient green agricultural hinterland and chiselled raw coastline. Cork’s former historic networks and contacts are reflected in its the physical urban fabric – its bricks, street layout and decaying timber wharfs. Inspired by other cities with similar trading partners, it forged its own unique take on port architecture. Twice a day and every day the tide sweeps in to erase part of this history. The river meanders through this city built on a swamp and sweeps in a sense its historic narratives along. Cork is bound to the river and tide as they are bound to it. It developed because of its connections through water to other cities in Ireland and within the former British empire. Exploring the harbour area, one can still find residues of the mud flat/ estuarine silt landscape that the city was constructed upon. It is a great feat of engineering to build a city on a swamp. There are many historic sites for the walker to explore. Of course each one of the sites deserves a book to be written on them and many have by the city’s array of local historians. Some of my walking tours take in the story of the early origins of the city – the monastic site of St Finbarr to Viking age histories to the Anglo-Norman walled town followed by historic areas such as Shandon, St Patrick’s Street, City Hall, Sunday’s Well and the Wellington Road Victorian Quarter. The first known settlement at Cork began as a monastic centre in the seventh century, founded by St Finbarre. This is now marked by the late nineteenth structure of St Finbarre’s Cathedral. it stands tall proud in its ecclesiastical heritage and also imbuing the city and wider region with a need for community to bring people together and to invest physically and morally in such structures. Hence, Cork has a myriad of church buildings with different styles from different times when such buildings were called upon to impart new messages about their contribution to the city. The main urban centre was built on a series of marshy islands at the lowest crossing-point of the river, where it meets the sea. One can imagine the timber posts struck into the marshland to mark out the tentative first couple of Viking houses, and the first fires lit in such flood prone structures. The Vikings were the first to develop a basic bridge spanning from the valley side to the marsh, now marked by South Gate Bridge. This was the start of a rich maritime history and a strong identification as a port town. The laying of the first block of the Anglo-Norman town wall must have been equally momentous. The actual stone from beneath the encircling southern and northern hills – sandstone and limestone provided the defences. The creeking open for the first time of Watergate and the control by the King’s and Queen’s Castles would have sparked excitement especially as the first timber ship clocked against the key walls. Similarly, the first ship from somewhere abroad in England or France would have brought a sense of wonder and acknowledgment in the city’s role in maritime western Europe. The topping out of St Anne’s Church Shandon and years later the addition of the bells and clocks would have met with delight and pride. From the top of Shandon, you can gaze down upon the multi-coloured fabric and multi-faceted narrative presented in its urban fabric. Climbing down and walking amongst the streets and laneways, and unravelling those narratives has brought great joy to me personally and has kept me with my camera and notebook in hand trying to make sense of Cork’s place in north west Europe as an ambitious and soulful place. Enjoy the walking!